When it comes to nutrition, we keep it simple. We know you are busy juggling home, work and family. We focus on the basics. We acknowledge the key roles both parents play to make an effective learning experience. This is why we create educational products that involve both children and their parents. We want to make it easy for the entire family to work as a team to establish good nutrition at home. This website is designed to make learning about nutrition and exercise easy and fun for you and your family. We are very proud to share our Showcase page of organizations that list Nourish Interactive as a very reliable and credible resource. You may also want to read our Visitor Comments to learn more about our site has helped families and children from other users. 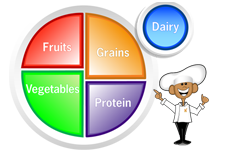 See a complete list of our nutrition games and what they teach. All of our tips were written by dietitians who are also parents. They understand the challenges of making healthy changes. Talking with children about nutrition doesn't have to be boring. We have created some imaginative and fun ways to get kids thinking and talking about healthy foods and exercise! Colorful fun printouts to start the conversation! Our interactive nutritional tools are action oriented and designed to help you make sound decisions about the nutrition and exercise your child needs. See all our nutrition tools! Find healthy recipes and share your favorite recipes. We have a special feature! Want to make the recipe healthier, we provide healthy substitutions. You will find useful and action-oriented articles about key nutrition topics that affect our kids’ health and well-being. All of our health and nutrition articles are written by health professional who want to help families learn about the fun and importance of eating healthy. Find a topic to help your child eat healtheir! Helpful ideas and tips from complete grocery shopping guide, fruits and vegetable guide, shopping list by food groups to cooking with kids and healthy cooking tips. Did you know that most children don’t eat a balanced meal? Did you know that over 80% of children don’t eat enough of the healthy foods their body needs for proper nourishment. This can affect their concentration and learning ability in school. Did you know that more and more children are overweight today? This can lead to a lifetime of health problems including diabetes or heart disease. We believe that prevention through early education is the best treatment. Understanding nutrition at a young age will give your children the knowledge and skills they need to make healthy choices throughout their lives. Nourish Interactive's mission is to offer fun, innovative solutions that empower children to make healthy choices. Nourish Interactive was created by healthcare providers and educators that are committed to promoting early nutrition education and healthy eating. Meet our health professionals on the Nourish Interactive Board. It is the position of The American Dietetic Association that nutrition education is essential for the public to achieve and maintain optimal nutritional health. Nutrition education should be an integral component of all health promotion, disease prevention, and health maintenance programs, through incorporation into all appropriate nutrition communication, promotion, and education systems.